Where, VCB is collector to base voltage and BVCBO is maximum reverse biasing voltage which may be applied before breakdown between the collector and base terminals. 9. Which of the following circuit comes under the class of sequential logic circuits? (A) When P and N regions are lightly doped. (B) When P and N regions are heavily doped. (C) Are of silicon material only. (D) When P and N regions are equally doped. 21. Which of the following is an advantage to use fiber optic data transmission? (A) Decrease to zero as time approaches infinity. (B) Increase as time approaches infinity. (C) Be undamped sinusoidal oscillations. (D) Be damped unsinusoidal oscillation and the damping factor will depend upon the relative location of the roots on the imaginary axis. (A) Port A with 8 input lines, Port B with 8 output lines, Port C (upper nibble) with 4 input lines and Port C (lower nibble) with 4 output lines. (B) Port A with 8 input/out lines, Port B with 8 input lines and Port C with 8 output lines. (C) Port A with 8 input lines, Port B with 8 output lines and Port C with 8 bits as either input or output lines. (D) Port A with 8 lines as input/output lines, Port B with 8 lines as input/output lines, Port C (lower nibble) with 4 lines as input/output lines. Port C (upper nibble) with 4 lines as input/output lines. 29. In 8253 programmable interval timer, in which modes, the counting is neither enabled nor disabled? 30. In which mode of 8259A programmable interrupt controller, all the Interrupt Requests (IRs) are arranged from highest to lowest with IR0 as the highest and IR1 as the lowest? 2. Thermal Drift is defined in terms of μ Amperes/°C. 3. Thermal drift is defined in terms of μV/°C. 4. Slew rate is defined in terms of V/μs. (i) A flip-flop is used to store 1-bit of information. (ii) Race-around condition occurs in J-K flip-flop when both the inputs are 1. (iii) Master-slave configuration is used in flip-flop to store 2-bits of information. (iv) A transparent latch consists of D type flip-flop. (i) A linear multiplier followed by a low pass filter. (ii) A linear multiplier followed by a high-pass filter. (iii) A diode followed by low pass filter. (iv) A linear multiplier followed byband-stop filter. (A) 1, 2 & 4 are correct. (B) 1, 2, & 3 are correct. 1. Quick withdrawal of the gate voltage. 2. Reducing life-time by doping with gold. 3. Applying a negative voltage pulse to the gate. (B) 1 and 2 are correct. (C) 1 and 3 are correct. (D) 2 and 3 are correct. 2. Donor level lies close to the valence band. 3. n-type semiconductor behavesas a conductor at zero Kelvin. 4. p-type semiconductor behaves as an insulator at zero Kelvin. (A) 2 and 3 are correct. (B) 1 and 3 are correct. (i) Reduction of current consumption in the circuit. (ii) Isolation from input to output. (iii) High impedance during OFF state. (iv) Low impedance during ON state. Arrange the above in the order, the parameter which is having minimum time to the parameter which has got the maximum time. 50. In the Assembly program, the following steps are to be followed. Find the sequence in which the program to be written for 8085 microprocessor. (iii) Enable or disable interrupts. (iv) Program should be completedwith last line as ‘END’statement. 57. (a) Bode’s-Plot representation (i) not a frequencydomaintechnique. (iv) Three 16 bit timer/event counters. 59. Identify the peripheral devices for their applications. a Stability of Control System 1. Oscillation in which the amplitude decreases with time. bUnstability of Control System 2. All roots of characteristic equation have negative real part. Directions: Q. Nos. 61 to 70, the following items consist of two statements, one labelled the “Assertion (A)” and the other labelled the “Reason (R)”. You are to examine these two statements carefully and decide if the Assertion (A) and the Reason (R) are individually true and if so, whether the Reason (R) is a correct explanation of the Assertion (A). Select your answers to these items using the codes given below and mark your answer accordingly. 61. Assertion (A): In amplifiers, it is easy to compare two powers on a Logarithmic rather than on linear scale. It is called decibel. Reason (R): Decibel is defined as N = 10 log P2 / P1 , where P2 is output power and P1 is input power. 62. Assertion (A): Magnetron is not cross field devices. Reason (R): They make use of electric and magnetic fields simultaneously. The fields are perpendicular to each other. 63. Assertion (A): TDM can be employed to transmit channels having unequal bandwidths. Reason (R): If sampling theorem is strictly followed, any analog signal can be reconstructed back from the samples. 64. Assertion (A): A NAND gate is called a Universal logic element. Reason (R): Any logic function can be realized using NAND gates alone. 65. Assertion (A): The stability of a control system can be determined from the location of roots of characteristic equation. Reason (R): For stability the roots should lie on the left half of s-plane. 66. Assertion (A): The intrinsic Fermi level of a semiconductor does not lie exactly at the middle of the energy band gap. Reason (R): The densities of the available states in valence and conduction bands of an intrinsic semiconductor areequal. 67. Assertion (A): The operating principle of Laser is based on stimulated emission process. Reason (R): In coherent radiation, the emitted photons have same phase, same polarization and same direction with the incident photon. 68. Assertion (A): A microprocessor interfaced with inputs, outputs and other peripheral devices is also called a micro controller system and is capable of controlling the process. Reason (R): The microprocessor is a device which processes the instructions. 69. Assertion (A): In control system design, the transfer function consists of both poles and zeros. To make the system stable, the poles plotted in Bode plot should be near to origin. Reason (R): The zeros must be also near to origin. 70. Assertion (A): A p-channel enhancement MOSFET based transistor can be turn on prematurely. Reason (R): Most contaminants in MOS fabrication are mobile positively charged ions and they get trapped between the gate and the substrate in an n-channel enhancement MOSFET, whereas they are trapped on the other side of the substrate in the case of a p-channel enhancement MOSFET. Read the paragraph and answer the Question Nos. 71 to 75. The field effect transistor is a semiconductor device which depends for its operation on the control of current by an electric field. There are two types of field effect transistor, the Junction Field Effect Transistor (JFET) and Metal-Oxide- Semiconductor (MOSFET) FETs operation depends upon the flow of majority carriers only. It is therefore a unipolar device. BJT is a bipolar device. FET is relatively immune to radiation and it exhibits a high input resistance tipically many mega-ohms. It is less noisy than a tube or a bipolar transistor. It exhibits no offset voltage at zero drain current, and hence makes an excellent signal chopper. FETs are more temperature stable than BJTs. 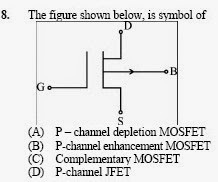 JFET is three terminal devices with gate applied potential control the flow of charges from source to drain. The n-channel MOSFET consists of a lightly p-type substrate into which two highly doped n+ regions are diffused. These n+ sections, which will act as the source and drain. A thin layer of insulating SiO2 is grown over the surface of the structure and holes are cut into the oxide layer, allowing contact with the source and drain. This layer results in an extremely high input resistance. (A) Decreases with increase in drain current. (B) Decreases with decreases in drain voltage. (C) Increases with increase in drain voltage. 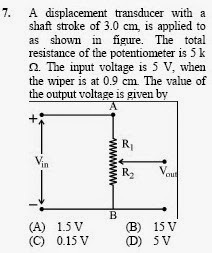 (D) Increases with decrease in gate voltage.